An 8 page bundle with various verb conjugation practice sheets, perfect for homework revision or working through together in class following a reminder lesson on the tense endings OR as a review test. 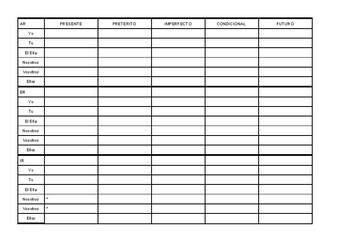 * Includes a written example worksheet for Haber in the Present with a supporting table to complete. The Haber table can be discussed and taught in class with the examples left for homework. 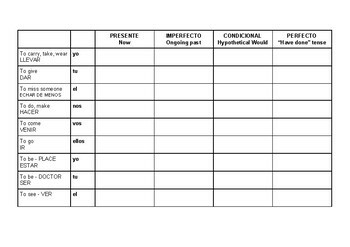 *Includes SER and ESTAR table - present and imperfect. *Also 2 table worksheets changing the same verb across different tenses in the same person ie: tengo, tenia, tendria, he tenido. 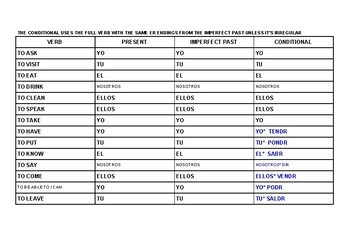 *A great table to discuss and teach IR in the present and preterite with the correct way to talk timings ie: la semana pasada, el próximo día - after teaching they can create their own phrases to say where they went or where they are going later in the year. 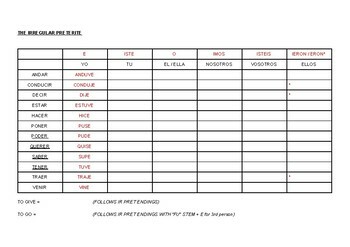 *Full A4 table for teaching the Irregular Preterite endings and stems.